Ended up changing to a small hyd roller and closed chamber heads. > what kind of numbers did the Bud Moore Intake made compared to the conventional single planes? Turns out we tested the Bud Moore intake on a 408C, not the dyno mule 351C. 88 jets in 950HP straight (no spacer) on the Blue Thunder intake. Blue Thunder was down 41 HP to the Strip Dominator. Regarding the Blue Thunder data in this post, it too were on a 408c NOT the 351c Mule? I've looked/googled many times looking for the output.... could you post the 351c data or a link to it? Working on a long term project, always enjoyed building 351C's over the years. 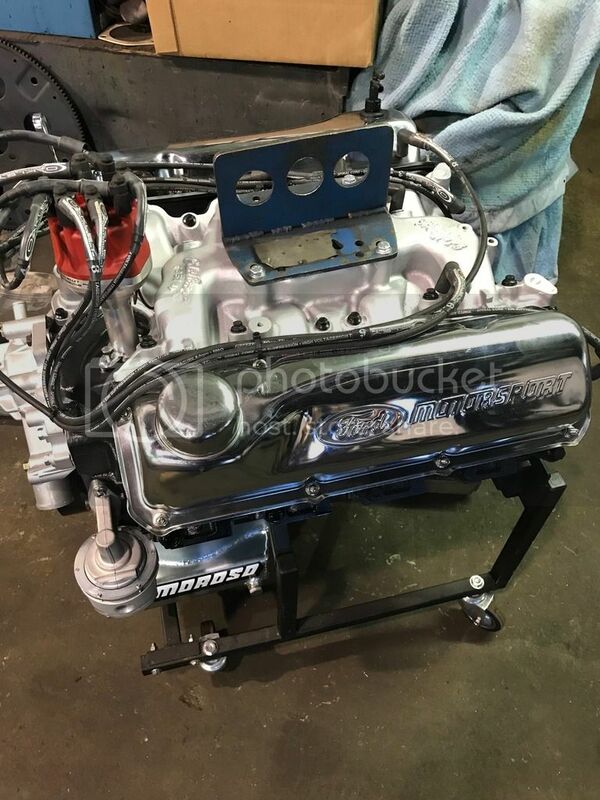 Havent decided on a Intake yet, but I have a Torker, a strip Dominator or a Bud Moore Box Intake to choose from right now, along with a couple for factory iron intakes. If I run the Torker or Holly Intake I'll run a 750 HP I put together for EMC a few years back or if I run the Bud Moore I'll put together a 750 Dominator. Yes there was a dyno test on a 351c that says other wise about OEM... BUT they ran with a 950HP carb for a 6000 RPM motor with very over sized carb bores... bigger to smaller will always KILL FLOW. But if the Blue Thunder unported data is correct [40 HP down], then the OEM out preformed it despite the carb bore intake carb mismatch. edited: took a little time to find it... have heard good things about the following HVH dual plain spacer. Going to try it, and run it upside down to help flow over/around the intake flange base. Why would you run it upside down? Those spacers work well as designed so I'm not sure what you'll gain by it. I'd dyno both ways if you have the time/capability, wouldn't hurt anything, but don't be surprised when it doesn't work right upside down. The single plain the tapper opens as it flows towards the intake. Prior to the ST4150-4AL, as mention earlier, I have run two 1/2'ish tampered spacers with the tappers pointing at each other... The top helps w/carb signals, the middle spaces help the air flow between all planes [like a notch/cutout], and the bottom one helps redirect air past the 4 hole intake plate/pad. Well that is interesting. I've never seen the ST4150-2AL. And like you said. It looks like it would funnel into the manifold vs funneling out of the carb. All the hvh super suckers I've seen have been the latter, where they attempt to make the transition out of the carb better. The main use of the st4150-2al is for the 602 series crate engines where any intake manifold modification is prohibited. I would think if you're not following the series rules you could modify the intake divider in a manner that will resemble the st4150-2al, and then see the same gains. I wouldn't run the spacer if there is a notch in the intake divider, I feel that would cause turbulence. There are definitely transition areas between the carb and intake that can show gains if attention is paid there. Last edited by dfree383 on Fri Apr 27, 2018 7:38 am, edited 2 times in total. I'm amazed of the big hp difference here. I would have guessed maybe a -20 hp difference at best. Can't remember any 351C or 351W dyno test that showed quite the same disparity.